Authority: Rabbi Yosef Naftali Aron Deutsch, Congregation Bais Yoel, Monroe NY, U.S.A. Source: photocopy of low-resolution hechsher image, apparently copied from the wrapper of a Migdanot baked product. 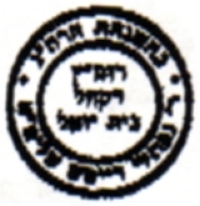 Comment: The Hebrew text shown below is based upon guesses of what the blurred words in the image might be.